Any Video Converter is a conversion tool that can convert so fast videos with better quality. Any Video Converter is a simple and effective software that allows to convert many video files such as AVI, ASF, MOV, RM, RMVB, FLV, MKV, MPG, 3GP, M4V, and VOB or AVI, WMV, MP4, 3GP, MPG (PAL or NTSC), MPEG-1, MPEG-2, FLV, etc. 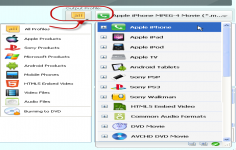 Along the other video converters for PSP, iPod , iPad , iPhone, Android ( Videora iPod Converter, iSquint (Mac), PSP Video 9 ... ) , Any Video Converter provides a solution based primarily on simplicity, the conversion is made fast without losing the image quality. The interface is extremely simple being necessary to only choose the file to convert, the output format and possibly make some fine adjustments (choice of codec, bitrate , resolution ... ) before starting the encoding. A preview of the video is also possible and allows to define a particular segment to encode.